Management by Options is !really! a new concept for success in general and for successful management in particular. It presents a consistent conceptual advancement of the Real Options Analysis (ROA). The current reading on real options dealing for instance with the valuation of future investments or in connection with company acquisitions is aligned instrumentally and calculatively, whereas the new idea behind the Real Options Approach is only articulated very rudimentarily, if at all. Management by Options however brings this options thinking into the foreground and makes it explicit. This is augmented with newer views of chance-management and the fundamental doubts on an excessive target-orientation. The decision behavior of managers, but also of individuals being eager for success, is in a very complex and dynamic world, in which we live and operate today, a great deal too sluggish and in-flexible, as long as we adhere to our customary goal setting processes. Management by Objectives, as it is described everywhere in the textbooks and as it is (still) commonly propagated in the companies does not any longer cope with the requirements of our „flexible” and volatile time. People have realized this and already behave quite differently as it (still) can be read in the literature and as it is (still) proclaimed by the success gurus and as it is (still) ritualized in the organizations. People want to enjoy their lives and want to act out, both professionally and personally, and are going to give meaning to their lives actively. They want to snap at their chances even though these chances may be extremely modest in the individual case. For that people are willing to render certain, but limited advance performances – occasionally shooting into the dark – in order to achieve an option on such particular chance. Hereby objectives in the conventional sense are totally irrelevant. Objectives, eventually set or imposed on by someone, stand a consequent realization of chances more in the way than they can expedite the success, people strive for. Management by Options however incite to detect diligently chances, to render small advance performances, in order to get at appropriate options, and when the situation develops advantageously the option holder will exercise his option finally to realize the benefit out of the respective chance. Otherwise he will abandon the option... or will hold it further until the constellation will become more favorable for him. This is an entirely different paradigm of behaving and success as it is meant by the obsolete objective-orientated method. In line with this outdated method first an ob-jective is set and then it is driven towards it by hook or by crook, full speed ahead. All relevant resources are concentrated on it. If then that target is missed it will be sear-ched for someone who caused this flop, who is guilty. In case the aim is achieved it will be celebrated, regardless whether it makes still sense having achieved this aim at all in this moment, since in the meantime the relevant conditions probably have already completely changed. Moreover in the case of much too rigid focusing on a certain objective suddenly appearing chances could not be perceived and thus will be disregarded. Within the options method no targets are needed, merely options will be provided. The stakes of advance performances are unlikely lower, since it does not right away go the whole hog under full steam. Thus the available resources can better be dosed and risks can much better be spread. You are able to open manifold options at the same time, which can be mixed virtuosicly over the following period. The risk to flop is materially decreased. Not until actually it should be smooth sailing and not until all other constellations seems to be favorable further and not until the assumed chance is still relevant and desirable, only then you can dig it and full strike price has to be paid in order to realize the chance effectively, i.e. the decision maker always keeps open many options over a very long time with relatively small expenses and remains until the very end (short before his decision) flexible and thus optimize his result; in easy cases it even can be deduced and/or proved mathematically. – Anyway, what will be there at last, has not been predetermined by an objective, but rather depends on the provided chances, on the initiated respectively on the rendered advances of the decider and last but not least on his/her sensitivity and presence of mind. The classic concept for success consists of giving a chain of targets, which you move along till you have achieved the focused objective via the several sub-goals. In our complexly interconnected and volatile time the unilinear concept however does not work any longer. Until the aims set by the executives are communicated through the hierarchy and are understood and accepted by the performing members of staff, until the aims can show effect at all, the world around us was, of course, going on turning round. Due to the method you are steering chronically behind the real trends. The world does not wait and unfortunately also does not conform to our goals we strive for. In the cold light of day setting of aims, that presently (still) governs the leadership techniques, is rather non-productive and comes very close to hubris implying the pre-setting of targets would support success. Nobody is able to know, where the train finally goes. Managers however pretend knowing it and even believe that they are paid for. But how many battles have already been lost, because the strategy was wrong, the tactics did not come even, the targets and/or point of time are badly chosen. The troops are totally perished. They all became (mostly dead) heroes! The presetting of targets is merely a matter of fantasy and lastly a matter of rhetoric. And it is also a question of power. He who is in power presumes to say what it's all about. But if you want to succeed without becoming a (mostly dead) hero, it is cleverer – instead of setting his/her aims – to manage his/her options smartly. That is no longer concerned with hubris, that is not an abstract meta-action dissociated from real-level, but the smart utilization of the asymmetric chance-risk-profile of that particular construct („options”). Thus Management by Options is a technique of chance-management. Managing of options always occurs knowingly and in the direct involvement of the operative reality and assures within the bounds of the respective, contingent possibilities and within an uncertain and volatile context the protection and finally the successful realization of emerging chances. Nowadays, when you will assure your success, you have to have several irons in the fire at the same time, to play on several pianos simultaneously, to run with the hare and to hunt with the hounds or to juggle with as many balls as possible. Only who manages his options cleverly has the prospect of success, whereas one hardly can say in advance, what will tangibly constitutes the success. But: Having success is better than not having one. And: Success is success! No doubt! The superiority of the options method will become quite clear in crises or when a catastrophe has happened. In a crisis situation – and... crisis is in a sense at all times! – objectives do not play a decisive role. Sure, as a matter of course everyone has the goal to get out of the crisis as rapidly as possible and to get away unharmed, but this is trivial. In such a situation however the options you have available on short call are decisive and how you activate, combine and manage them; this apply in personal crises accordingly. Also in such cases at first you have to make clear on your available options and then you can proceed. In order to change to the options method firstly you have to understand the alternative construct („options” instead of „objectives”), which underlies the new management paradigm. The objective method is imparted to us from a very early age and there-fore it sticks deeply inside us. Thus you cannot simply throw a lever, but rather you have gradually moved from the ancient world of objectives into the modern world of options. You talk less about objectives, but more and more about options. In the long run you should eliminate the terms „objective', „target”, „aim” and „goal” etc.. In the beginning it sounds a little bit strange, but later you get that it works. Thus you succeed in the about-turn to the new method. Instead of agreements on objectives you have a discussion about the asset of options or about options that offer. Options are definitely qualified as a new appropriate management-construct. The suggestion for companies and for personal environment, as well, to go off the antiquated, however widely internalized Management by Objectives and in lieu thereof to change to a Management by Options, means a revolution which especially in the companies will free up immense potentials for success, they are however restrained by officially set targets up to now. All employees exploit their full potentials and tap their options. They swarm – now without being restricted by some target agreements – and try to make contracts and to initiate deals, to get one's foot in the door. Companies and individuals as well, they are going to engage with the Management by Options, will lose the bulk of its previous sluggishness and can perform from now on exceptionally agile. So these entities gain a distinct competitive advantage against their competitors, who (may be) are going on to manage anciently their processes using objectives. Management by Options result willingly in a little bit more chaos, in return for that you get a management concept which is more adequate in our fast moving and volatile business situation of today. The complexity around us will not primarily be met with reduction of complexity, rather than complexity will be confronted with „options” (in lieu of „objectives”) that is itself a construct with little more complex inner structure. Management by Options is more flexible and less bureaucratic. It can be dispensed with formal budgets and thus there will be not any longer controlling in the customary sense. This however does not mean that in the future there should be no necessity to go on dealing with future aspects. Dealing with the future is no longer executed with formal budgets and final guidelines, but with projections and forecasts, the evaluation of prospective consequences of the made decisions (or non-decisions) and with what-if-simulations and sensitivity analyses. In the same directions tends also the Beyond-Budgeting movement, recommending among other things to manage applying 'flexible objectives'. Thus however is yet very close to the options method. There are authors, they say, that people in China and India (and in other emerging markets) possess a fundamental advantage that we (western people) cannot easily make up, since they were trained from childhood to cope and arrange successfully their lives with a bigger quantum of chaos. In our globalized, volatile world this is a huge advantage indeed. Understanding this you also guess, why small and medium-sized enterprises (SMEs) often outmatch big conglomerates. This is not only caused by shorter decision making processes and more direct communication channels, but also the SMEs do not waste their time with to a large extent starving rituals of the objective method, but are managing their options and try to receive the next order. They are jamming and living somehow from hand to mouth. But why not, if thus they succeed. Individuals also have neither enough time nor nerves to dwell in the meta-actions of world of objectives. Who wants to be successful, can not lose time with long strategic considerations (and meetings). It also does not pay for him if he moans when an envisaged target has been missed. Hereon the world does not pay respect. Every single person have – within the boundaries of his/her contingent possibilities, with regard to his/her arsenal of his/her options – to pave the own way to one's success and happiness. That applies in a similar manner to interacting groups of people and consequently to large organizations as well. 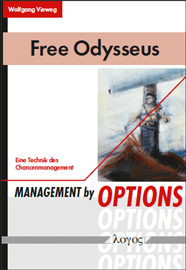 „Erfolg durch Management by Options” is not an academic textbook, and should not be such a one, nor it is unscientific. It is substantiated, but nevertheless plausible and easy to read, for it intends to bandy about a !really! new method. Management by Options is up to date, Management by Options is „in”!